I always have maintained that my two daughters are among my greatest teachers, and recently, my oldest daughter taught me a valuable lesson in being good to myself when I was feeling badly. For the last few years, I have dealt with recurrent bouts of depression and anxiety, and thankfully, they no longer plague me each day. The depression stays at bay for the most part, but the anxiety rears its head from time to time, leaving me completely out of sorts. When the anxiety overwhelmed me yesterday, I was so fortunate to be able to confide in the trusted people who make up my support system, as they helped me to navigate the emotional minefield once again. I also was treated to an unexpected source of kindness and support that came in the form of my thirteen year old daughter. I am very careful not to burden my daughters with the emotional punch that the depression and anxiety can pack, but I also am honest, in age appropriate ways about my feelings, as I want them to understand them and to know it is okay to express feelings and emotions and to ask for help, if needed. I have made clear that they are never the cause of these negative feelings, and they understand and believe me. They display compassion and kindness that some adults lack, and my oldest daughter demonstrated this in such a simple, yet kind and powerful, way. 1. Remember, it’s not the end of the world. Of course, she was right, as I knew that these current situations could and would change and that these negative feelings would pass, as well. Her wise words were like a helping hand to pull me out of the negative quicksand that was pulling me under, as they helped put things in perspective. 2. Have a good cry. Tears can be a great release, so, instead of fighting to hold them back, I let them flow later. Rather than berate myself for what I sometimes perceive to be a sign of weakness, I regarded my tears as an outlet for the anxiety and grief. I felt as if I would never stop crying, but I did, and when I did, I felt a bit better. 3. Go to bed, and try again tomorrow. It will be okay. 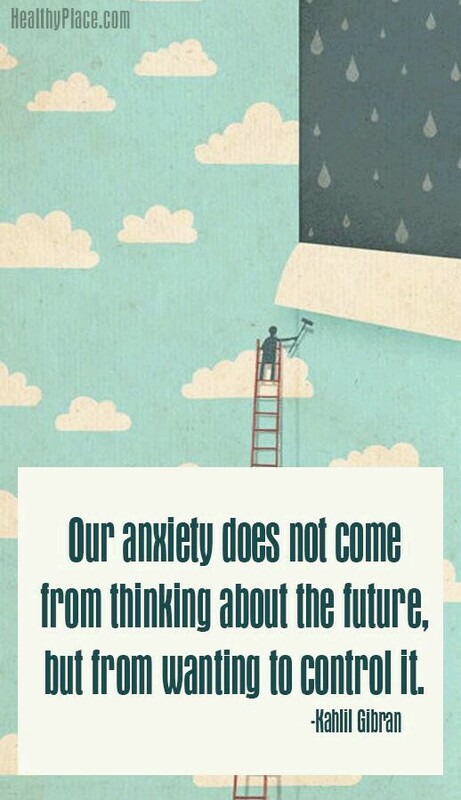 The fear of the unknown and my desire to control the outcome of future events and current situations often trigger an anxiety attack, and I feel like it will never get better. Sometimes, when I feel this way, I skimp on self-care, including allowing my body and mind to rest. So, I put myself to bed at a reasonable hour, and even though the anxiety greeted me to begin my day, a night of rest and support from friends helped me reclaim my peace of mind to salvage my day. As I recover from this latest battle with the anxiety, I am looking for the lessons it has to offer me. Two of the greatest lessons are to be kinder to myself and to take my daughter’s advice more often, as she is both kind and wise indeed. Thank you for sharing this heart felt post. How wonderful to have your support system. Your oldest daughter shows such maturity for her age. What a blessing to read of her response. I tend to cry a lot, and myself find it a wonderful release, but hardly ever when there are others around, because of that “weakness factor”. Thank you so very much, as I appreciate your kind words and empathy. My daughters are my greatest joys, and my oldest daughter helped me tremendously. I love them both so much and just want to be the best mom possible for them. Great piece from a great blog! Many thanks for reblogging this post! Your post is a wonderful example of how close children still are to basic wisdom. We are losing it over time since we are taught to face reality or to be reasonable. But children are still so pure and clear in their feelings and perception. You are blessed for your daugters but also for your openness to listen to them. Thanks so much for sharing your wonderful words, and I absolutely agree with you. Children often have such valuable lessons to share, if only we pay attention. I am truly blessed. Hmmmm…that child must have quite a mom! I hope you’re feeling much better. Aw, thank you so much, and I am happy to report that the anxiety has decreased at last. Now, I just need to regroup and keep practicing ways to prevent and manage it better. Thank you so much, as that is quite a compliment! Your daughters must make you very proud. Thank you for sharing such kind words! My daughters definitely make me extremely proud, and they are such sweet and wise souls. While I certainly wish none of had to deal with depression or anxiety, I take heart in knowing that I am never alone. Your daughter seems to be a very kind person and wise beyond her years. Elizabeth, thank you so much, and she definitely is both. I totally agree about sharing some less stressful and age appropriate things with your daughters. I did this with mine helping them understand that mum and others were only human and had their up and downs sometimes. It’s true their simple wisdom can be amazing (their minds are less cluttered) but the biggest pay off for me is we remained close throughout their teenage and adult years. As our relationships changed there was always honesty and understanding. We were there for each other and now the older ones are there for me and their siblings. I think this will bare wonderful fruit for you. Claire, what a wonderful mum you are, and it sounds like your children are just as amazing! I really appreciate you sharing your experiences and observations. I hope that my daughters and I continue to have a relationship that is built on love and honesty. Many thanks, and all my best to you and yours. I so appreciate you sharing this post! That is definitely another great piece of advice to add to the mix, and I thank you for it! What a wise wonderful daughter you have. She has a great mom as well. I dealt with the same situation in trying explain to my son how I was feeling during the difficult times and he was also a loving wise source of love to me as well. I envy your support system dear Kristi. You are truly blessed. Many thanks for your kind words, Sheila, and for the wonderful reminder of how blessed I really am! You have raised a kind compassionate caring daughter. You are lucky than most mothers and she is luckier than most daughters. I cannot imagine my daughter having the empathy your young daughter shows. Thanks so much, as I feel lucky that we have each other, in addition to my youngest daughter. I may be biased, but they are extraordinary girls! Thank you so very much; I really appreciate that! Wonderful advice. Your daughter sounds lovely. I have often recognized the importance of releasing certain feelings. I often hear from people that I should just be happy, but I do not think it is always possible to ‘just be happy’, sometimes the emotions you are feeling need to be released. You are so welcome, and thank you for your kind words and additional feedback. I agree that it can help to experience and release the feelings indeed.